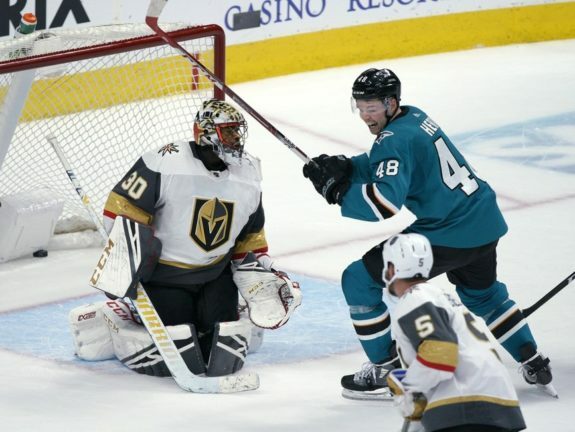 SAN JOSE, Calif. — Brent Burns scored on a power play at 22 seconds of overtime and the San Jose Sharks snapped a seven-game losing streak, beating the Vegas Golden Knights 4-3 on Saturday night. Karlsson opened the scoring at 3:54 of the first period. The Sharks tied at 58 seconds of the second period on Hertl’s 35th goal of the season and fourth in five games. NOTES: Vegas G Marc-Andre Fleury (lower body injury) missed eighth straight game. …… Vegas’ Ryan Reaves was assessed a 10-minute misconduct penalty and two minutes for roughing for his role in a brawl late in the first period, and Sharks C Joe Thornton was assessed a two-minute penalty for roughing.